NBA / TwitterLeBron James used the backboard to pass to himself before sinking a basket. LeBron James scored a stunning basket after using the glass to pass to himself. The move became the must-see highlight of a Los Angeles Lakers win that bucked a losing start to the season. 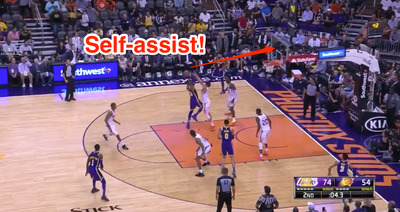 The Lakers beat the Phoenix Suns, 131-113, on Wednesday night. LeBron James helped the Los Angeles Lakers score their first victory of the NBA season Wednesday night when he put up 19 points, 10 assists, and seven rebounds. James sat out the fourth quarter with the Lakers already 20 points ahead of the Phoenix Suns, winning 131-113 by the end of play. But one moment in the game stood out from the rest. 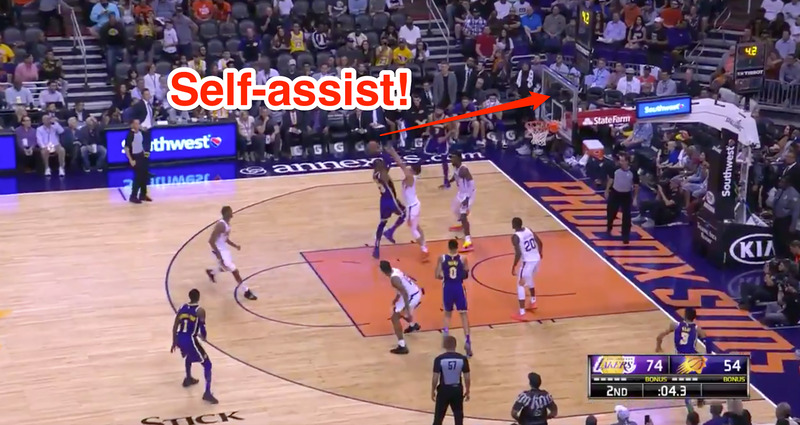 With the Lakers ahead 74-54, James pirouetted through Suns guard Trevor Ariza and passed to himself before sinking a basket that stunned the match commentators. With four seconds left in the second quarter, James threw the ball against the glass as a self-assist before casually scoring the rebound. ???? LEBRON ASSISTS LEBRON ???? The win was the Lakers’ first after starting the season with three straight losses. The team is next in action Thursday when it takes on the Denver Nuggets at the Staples Center.